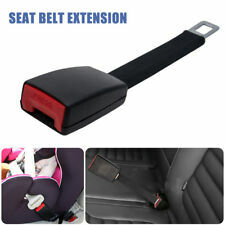 Excellent quality new universal 3 point seat belt. Static wire buckle - 255mm long. RED webbing 3 Point universal seat belt. Excellent quality new universal 3 point seat belt. Static belt webbing - 400mm long. ~The product has E4 Certification ~. Belts have been designed so the belt does not tangle or twist when entering the reel. Does not automatically lock without force - always retracts both ways. 1 X 3 point car seat belt. 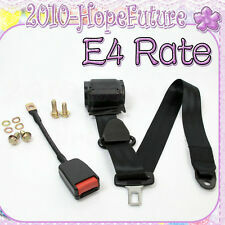 Universal 3 Point Inertia Seat Belt 3m Length & 23cm Length Buckle End E4 Rated. WITH SPECIAL ANTI TANGLE AND ANTI TWIST WEBBING! 23 CM LONG WEBBED BUCKLE END. Ending Soon. ALL OUR SEAT BELTS WORK WHEN FITTED IN HORIZONTAL AND VERTICAL POSITIONS. 2 x Universal 3 Point Retractable Car Seat Belt. This an universal seat belt which is suitable for most kinds of cars. Type: 3 Point Car Seat Belt. Extend belt Length: 0.7m-0.8m. Applicable: Universal. Static belt webbing - 400mm long. WITH SPECIAL ANTI TANGLE AND ANTI TWIST WEBBING! 30 CM LONG WEBBED BUCKLE END KIT. Ending Soon. E4-ECE-R16 Specification & Certified. ALL OUR SEAT BELTS WORK WHEN FITTED IN HORIZONTAL AND VERTICAL POSITIONS. Conforms to ECER16, E9. Excellent quality new universal 3 point seat belt. Webbing buckle. 1 x Safe Belt Extender. Size: 24.5x4.5cm/ 9.45x1.77" approx. We are unable to take any responsibility for any custom delay. Pet Supplies. Seat belt buckle is tightly connected to the belt, and only pressing can loosen it. Three-point seatbelts are safer and more protective of drivers and passengers. This automatic locking retractor seat belt is designed for front driver`s seat and front passenger`s seat. Land Rover: Series 88, 109. Land Rover: Discovery 1. Buckle connection length: 30cm. Replaces standard drivers and passenger side seatbelts or can be retro fitted to earlier models with suitable single bolt mounting brackets. 2 x Universal Campervan Bed, Rock and Roll Bed Seat Belt. 3m long webbing with 30cm webbed buckle end. These belts are not suitable for any car or vehicle that uses a top guide bracket. Anti-tangle webbing, Inertia reel protected with plastic cover. 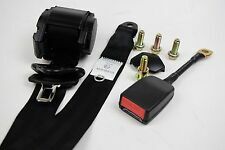 1 X 4M 3 Point Retractable AUTO Car Seat Lap Adjustable Belt. Belts have been designed so the belt does not tangle or twist when entering the reel. Does not automatically lock without force - always retracts both ways. WITH SPECIAL ANTI TANGLE AND ANTI TWIST WEBBING! 44 CM LONG WIRE BUCKLE END. Ending Soon. FITS MOST 4x4 VEHICLES, CARS, BUSES, COACHES, TRUCKS, LORRIES, HGV, FORK LIFT TRUCKS, CAMPER VAN BEDS ETC! SORRY BUT WE CANNOT ADVISE ON WHICH VEHICLES THESE BELTS WILL FIT. 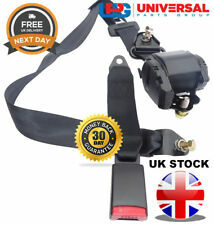 2x Universal 3 Point Seat Belts 3m Length & 15cm Plate Buckles. E4. UK. VAT Inc.
Anti-Tangle and Anti-twisting webbing 1 X 4M 3 Point Retractable AUTO Car Seat Lap Adjustable Belt. 3M Seat Belt 4M Seat Belt 3M Seat Belt. Car seat belt is one of the most serious problem. Most often, the car seat belt plays a great important role in driving. Seat Belt Style Centre Buckle. 3 Point Fixing. 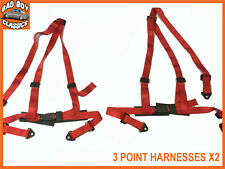 PAIR OF QUALITY 2" SEAT BELT HARNESS. 44 CM LONG WIRE BUCKLE END. WITH SPECIAL ANTI TANGLE AND ANTI TWIST WEBBING! Ending Soon. E4-ECE-R16 Specification & Certified. ALL OUR SEAT BELTS WORK WHEN FITTED IN HORIZONTAL AND VERTICAL POSITIONS. 1 X 3M 3 Point Retractable AUTO Car Seat Lap Adjustable Belt. 3M Seat Belt 4M Seat Belt 3M Seat Belt. Car seat belt is one of the most serious problem. Most often, the car seat belt plays a great important role in driving. 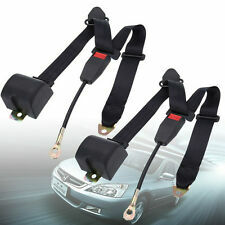 2 X 4M 3 Point Retractable AUTO Car Seat Lap Adjustable Belt. Anti-Tangle and Anti-twisting webbing 3M Seat Belt 4M Seat Belt 3M Seat Belt. Car seat belt is one of the most serious problem. Most often, the car seat belt plays a great important role in driving. 3m webbing with a 30cm Buckle End. Universal 3 Point Seat Belt. ideal for campervans and rock and roll beds. Will fit a variety of vehicles. Rigid Car Seat Belt Extender is made of a stiff cable that allows it to stick straight up when buckled in. This Extender is excellent for those who can\\\'t buckle up, including It is the strongest, safest and most comfortable Extender on the market. This an universal seat belt which is suitable for most kinds of cars. 2 x Universal 3 Point Retractable Car Seat Belt. Type: 3 Point Car Seat Belt. Applicable: Universal. High quality nylon fabric belt for wear-resistant. Suits all vehicle that have 3 bolt points. In minor collisions, seat belt usage has proven to reduce the potential injury to drivers and passengers. Buckle connection length: up to 35cm. The longest adjusted length is 190cm ( included the extend side). 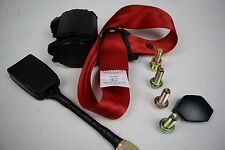 2 AUTO SEATBELTS BLACK 3 POINTS CAR SEAT BELT LAP BELT. Webbing length, end bracket up to tongue: 190cm. In minor collisions, seat belt usage has proven to reduce the potential injury to drivers and passengers. 2 x Universal 3 Point Retractable Car Seat Belt. This an universal seat belt which is suitable for most kinds of cars. Length of Extended :about 3m. Type: 3 Point Car Seat Belt. Extend belt Length: 0.7m-0.8m. Security issues must be paid the utmost attention to drive.This seat belt will lock in an emergency reducing passengers collision possibility in car to protect the drivers and passengers. Specification: Type: 3 Point Car Seat Belt Material: Durable Nylon Fabric ABS Plastic Steel Compatible: Universal Color: Black Tensile Strength: 1.47KN Length(Total Extended): 3.3m Webbing Width: 47mm Webbing Thickness:1. Land Rover: Series 88, 109. Land Rover: Discovery 1. Replaces standard drivers and passenger side seatbelts or can be retro fitted to earlier models with suitable single bolt mounting brackets. Can be fitted to left or right hand side. Conforms to ECER16, E9. THIS IS FOR INERTIA REEL ONLY (No buckle included). 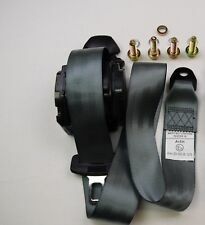 GREY 3 point universal inertia seat belt. Excellent quality new universal 3 point seat belt. Anti tangle webbing, Inertia reel protected with plastic cover. Extra long 3.5m webbing with 15cm flat buckle end. 2 x Universal Campervan Bed, Rock and Roll Bed Seat Belt. These belts are not suitable for any car or vehicle that uses a top guide bracket. THESE SEAT BELTS WORK WHEN FITTED IN HORIZONTAL AND VERTICAL POSITIONS. ANTI TANGLE AND ANTI TWIST WEBBING. 15 CM LONG FLAT PLATE BUCKLE END. SORRY BUT WE CANNOT ADVISE ON WHICH VEHICLES BELTS WILL FIT, YOU WILL HAVE TO LOOK AT PICTURES AND CHECK AGAINST YOUR VEHICLE. Twin release buckle. In minor collisions, seat belt usage has proven to reduce the potential injury to drivers and passengers. Webbing length, end bracket up to tongue: 190cm. Buckle connection length: up to 34cm.